"41HS3, Extra-32" by Timothy K. Perttula and Robert Z. Selden Jr.
DECORATION (INCLUDING MOTIF AND ELEMENTS WHEN APPARENT): The rim is divided into four sections by vertical excised columns with triangular ends (n=2) or excised brackets with negative SZ elements (n=2). Between these dividers are four upper or lower nested engraved triangles with spurs and nested oval elements. Ripley Engraved, cf. var. 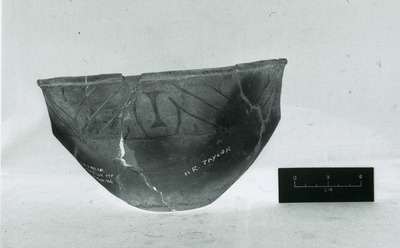 Williams carinated bowl (Extra-32) from the H. R. Taylor site.